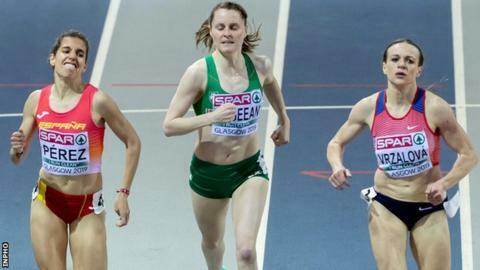 County Down athlete Ciara Mageean qualified for Sunday's 1500m final at the European Indoor Championships as a fastest loser after finishing third in her heat in Glasgow. With only the top two guaranteed final spots, Mageean clocked 4:08.15 which left her behind Spain's Marta Perez and Czech athlete Simona Vrzalova. But after a nervous wait for the last heat, Mageean's spot was confirmed. The Portaferry athlete was the quickest of the fastest loser qualifiers. "The key is recovery now and I'm really happy to make the final," said Mageean after running her second fastest indoor 1500m. The 2016 European outdoor 1500m bronze medallist ran a tactically sound race as she stayed on the shoulder of Vrzalova for the opening 1400m. However, despite looking comfortable, Mageean was unable to get past the Czech athlete in the closing 100m as she was also passed by Spaniard Perez who won in 4:08.05 - 0.01seconds ahead of Vrzalova. Mageean has produced an impressive indoor campaign which included improving her own Irish indoor 1500m record to 4:06.76 in Athlone last month. Britain's gold medal favourite Laura Muir safely progressed to the final by winning the opening heat in 4:09.29. Castlederg high jumper Sommer Lecky had a disappointing senior major championship debut for Ireland as she could only manage a best leap of 1.75m as she finished 26th in qualifying after missing three attempts at 1.81m. The Finn Valley athlete cleared 1.90m to win a world under-20 silver medal last summer and she cleared 1.86m at the recent Irish Indoor Championships. A number of athletes who cleared 1.89m managed to progress to the final. Letterkenny athlete Mark English produced a composed performance to win his 800m heat in 1:49.39 which qualified him for Saturday evening's semi-finals. However, English's team-mates Conall Kirk and Zak Curran both bowed out. Annadale Striders' Kirk finished sixth in his heat in 1:50.50 - 1.55 seconds outside his personal best set at the Athlone International meeting last month - while Curran was fifth in his qualifier in 1:49.77. After earlier qualifying for the women's 400m semi-finals as a fastest loser, Cork woman Phil Healy was unable to progress to the final as she finished third in 53.65 seconds. Healy endured misfortune on the closing bend as she lost momentum after being clipped by Italian athlete Ayomide Folorunso, who fell following the coming together. However, Healy was already well the automatic qualifiers Switzerland's Lea Sprunger and Lithuania's Agne Serksniene when the incident as the Swiss athlete clocked a European lead of 51.90 with the Lithuanian posting a national record of 52.33. The Cork woman was third in her morning heat in 53.13 as her team-mate Sophie Becker exited following a 53.99 clocking which left her fifth in her race. In the men's 400m, Ireland's hurdles star Thomas Barr and Cillin Greene both exited. Barr finished fifth in his heat in 48.22 while championship debutant Greene fell in his qualifier after a typically rough and tumble indoor 400m. In the men's 3,000m heat, Sean Tobin narrowly missed on a place in the final as a season's best of 7:56.25 left him fifth in his heat. However, team-mate John Travers endured a chastening experience as he finished 14th in his heat in 8:12.54 - over 17 seconds slower than his personal best indoors for the distance. Siofra Cleirigh Buttner, meanwhile, bowed out of the women's 800m after clocking 2:06.00 to finish fourth in her heat as only the top two progressed.